"Legend City was originally conveived in the late 1950s by Louis E. Crandall as Arizona's answer to Disneyland. 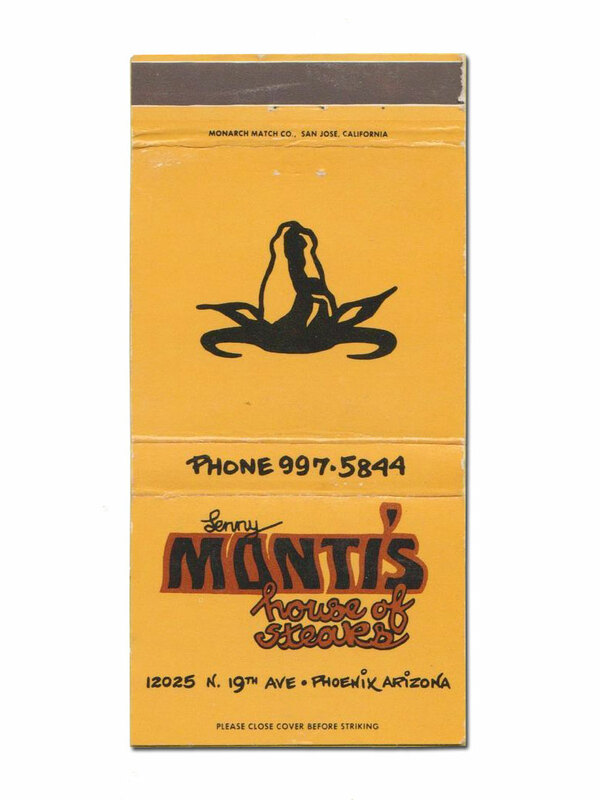 For kids living in the Phoenix area in the 1960s and 70s, it was an entertainment mecca, a unique and fun place for a magical afternoon or an evening out. Opened in 1963 and closed forever in 1983, Legend City will long be remembered for its Old West atmosphere, cool rides, charming attractions and presentation of such splendid local talent as Vonda Kay Van Dyke, Dolan Ellis, Mike Condello, Hub Kapp, and of course, Wallace and Ladmo. A vanished treasure in Phoenix entertainment history." Legend City was the closest thing Arizona ever had to a Disneyland type amusement park. The park opened in 1963 and closed in 1983. It had a number of attractions, amusements, and rides - one of which was the Log Jammer flume ride. Though the park has long been closed, one enterprising man was able to save part of its history in a most unusual way. He acquired one of the original log ride cars from Legend City (car No. 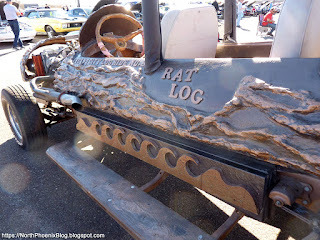 8) and has transformed it into a running, driving hot rod, or as he calls it, a "Rat Log." An original ride car from the Log Jammer ride at Phoenix's defunct Legend City amusement park has been transformed into a running, driving automobile. 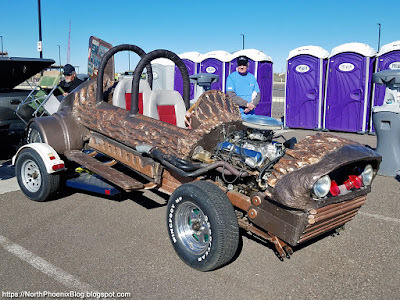 Riding on a modified Chevrolet chassis with a 350 cubic inch V8 engine, the vehicle has been fitted with two seats, one in front of the other, similar to the F-4 Phantom fighter jet. 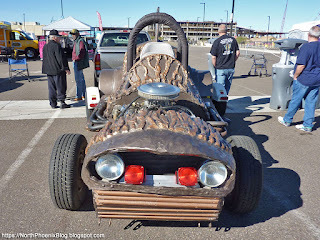 It has headlights, turn signals, running boards, and a custom "wooden log" steering wheel. 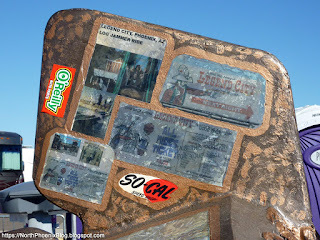 The vehicle is adorned with memorabilia from Legend City on the tail, including laminated entry tickets from the 1970s. It was quite a cool creation, and I'm thrilled that the history of Legend City is being preserved in such an eye-catching way. I'll bet the owner gets questions about this car everywhere it goes! Running boards help with easy entry to the vehicle, which does not have traditional doors. 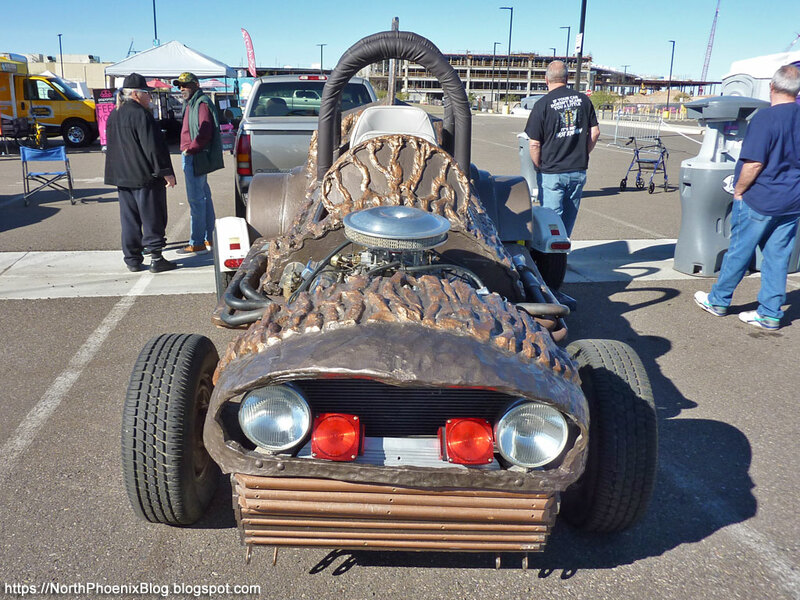 Though never intended to be a road vehicle, this former amusement ride has been adapted to a car quite well. Memorabilia from Legend City, Phoenix's former amusement park. The greater Phoenix area is made up of more than 20 incorporated cities, towns, and census designated places. Collectively, the "metro Phoenix" area is home to 4.7 million people. As these cities and towns grow closer together into one giant mass of sprawl, how do they retain their individual identities? 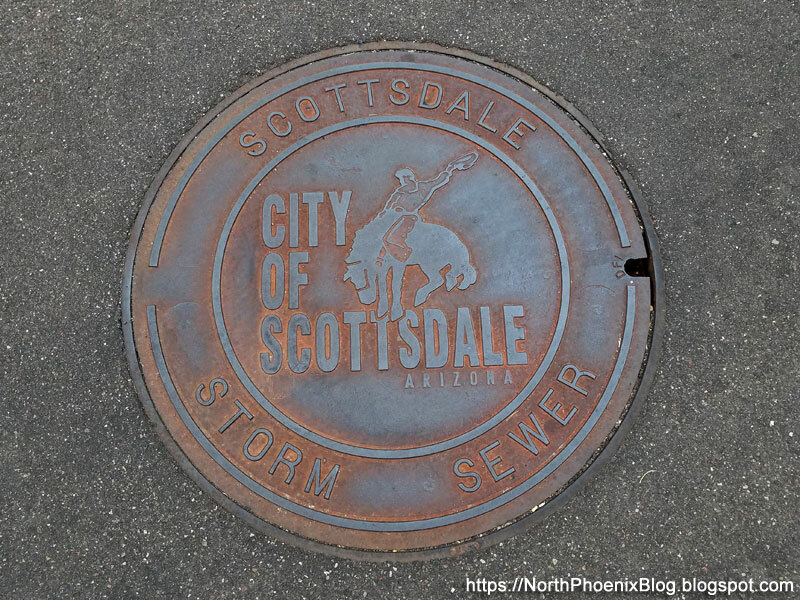 One small way that cities set themselves apart is with decorative sewer manhole covers. Here are five good ones that I've come across in the Phoenix area. 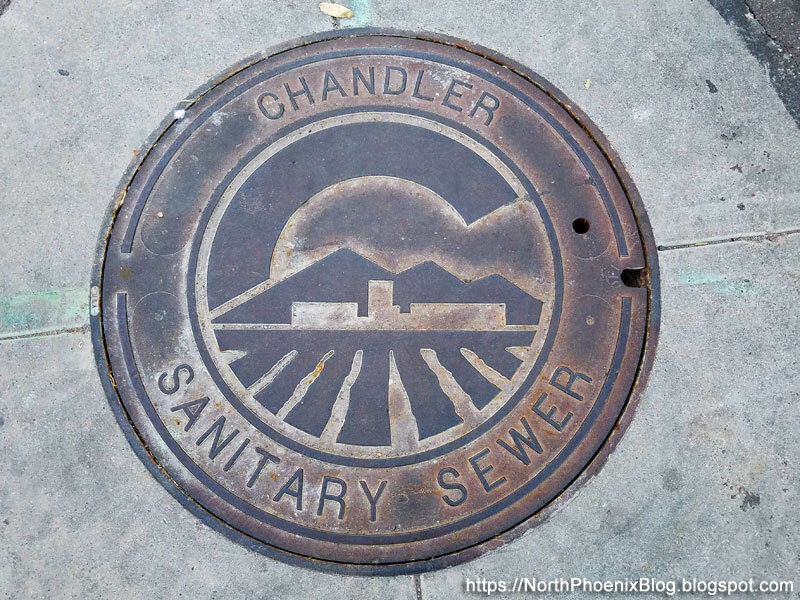 I will update this post with more unique sewer and manhole covers as I find them. 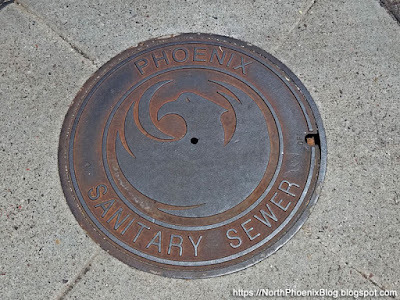 City of Phoenix sanitary sewer cover featuring the Phoenix bird symbol, which was designed in 1987 in a widely publicized design contest. The winning entry was a design by the firm of Smit Ghormley Sanft and became the official city symbol in 1990. 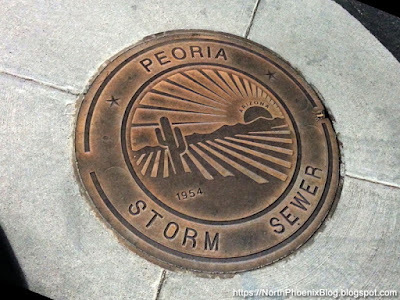 City of Peoria, AZ storm sewer cover featuring a setting sun, mountains, a Saguaro cactus, and an agricultural field in the foreground. The year 1954 is when Peoria was incorporated as a city. 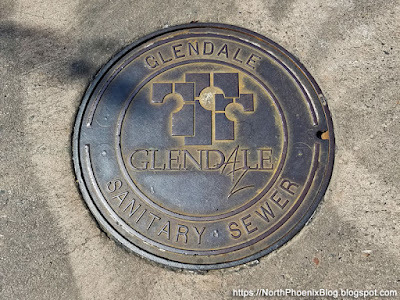 City of Glendale, AZ sanitary sewer cover featuring the three pillar design that appears throughout the city. The pillars represent three key elements of community—the citizens, the business sector, and the government that serves them. They were adopted as the city's official logo in 1990. City of Chandler, AZ sanitary sewer cover featuring the city's official logo, which was adopted in 1994. It has a stylized "C" with the San Tan Mountains, the growing city, and agricultural fields in the foreground. 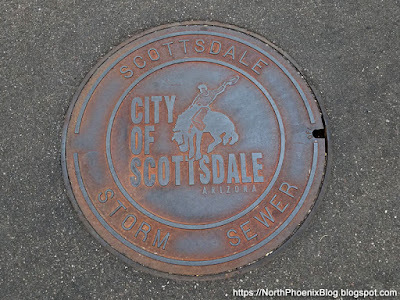 City of Scottsdale, AZ storm sewer cover features a cowboy riding a bucking bronco. The design was adopted as the official city seal around 1951. It was designed by local artist Gene Pennington and was based on an actual Scottsdale cattleman and resident Gerbacio "Harvey" Noriega. What is a County Island in Phoenix? Phoenix may be in the middle of the desert, but you may be surprised to learn that we DO have islands here! Not the kind with sand and a palm tree - I'm talking about county islands. In this post I am going to talk about county islands for those who are not familiar with them. If you have recently moved to Arizona from the East Coast or the Mid-Western United States or are thinking about moving here, the concept of a county island may be completely foreign of to you. Let's start with a definition: A county island is an area of unincorporated land which is completely surrounded by an incorporated city or town. 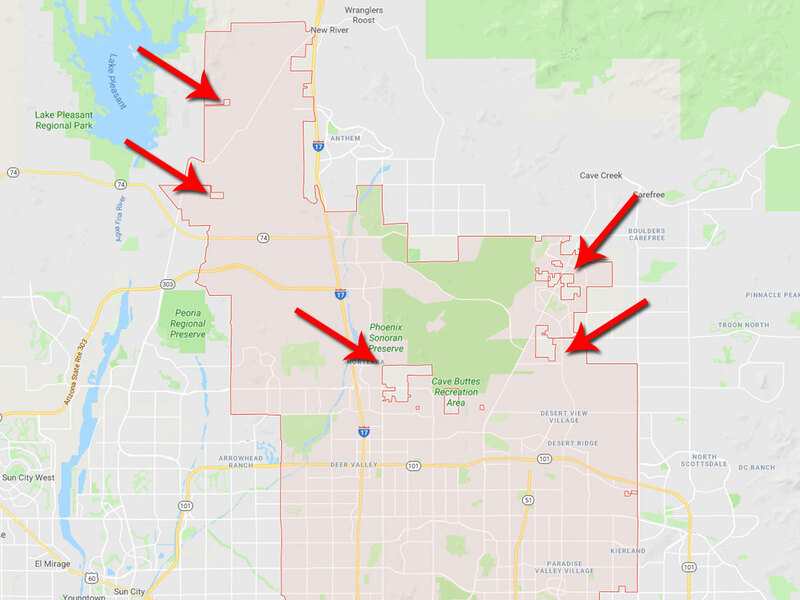 That's right, even if you buy a home within the City of Phoenix and have a Phoenix address, you may be on county land and not technically part of Phoenix! How do you find county islands? In the example below, all I did was perform a search for "Phoenix, Arizona" on Google Maps. Google outlines the city boundaries, but you can see that there are some irregular shapes which are not part of Phoenix, even though they may be surrounded on all sides by Phoenix - hence the name, islands. Many other Phoenix-area cities including Glendale, Tempe, Chandler, Gilbert, Queen Creek, and others have county islands as well. 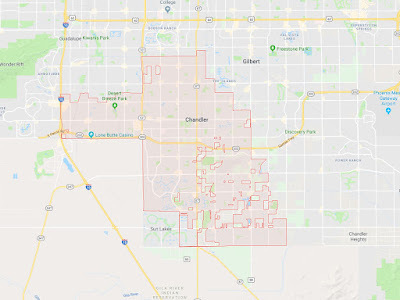 In the example below, you can see that the city of Chandler, AZ is full of them, particularly in the southern portion of the city. 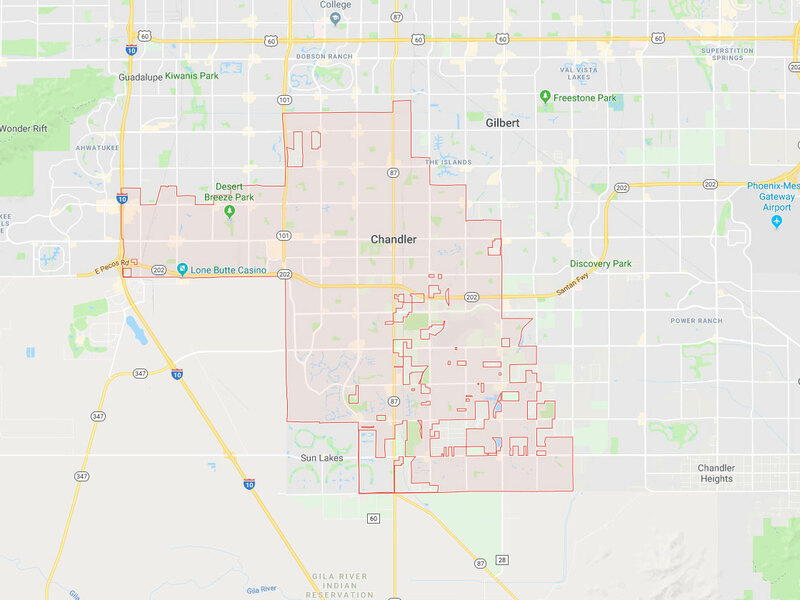 The actual boundaries of the city of Chandler are quite unusual! What are the pros and cons of living in a county island? There are some pros and cons of living in a county island, which I will explore below. I must preface this with the disclaimer that I am not a licensed realtor or a lawyer, and it is YOUR responsibility to look up local laws and ordinances in your area, as they will certainly vary from one jurisdiction to another. Residents of county islands generally do not have to pay residential property tax on their home, because property tax is levied by cities. Federal, State and County laws still apply, but city laws may not apply. Therefore residents may be able to store and work on vehicles, own chickens, goats, horses, or other livestock not permitted by residential city codes or ordinances. County Island residents are not governed by Home Owners Associations (HOAs). This is why you will often find horse properties, commercial vehicle storage, and other activities taking place within county islands which are typically not permitted within most cities and towns. An example would be a person who stores a large motorhome, boat, or other recreational vehicle on their property. Within city limits, the homeowner is likely to get complaints from neighbors about the large vehicle parked on their property - which could result in a city code violation. A person living on county land will typically not have such restrictions, which are often part of a city's code or charter. Another example would be the owner of a company. Perhaps it is a construction company, plumbing, electrical, roofing, HVAC, or other home services company - or perhaps a commercial towing operator, etc. Within many cities, homeowners cannot store a fleet of commercial vehicles at their house. Within a county island however, this is often permitted. Homes are typically not connected to city services such as water and sewer services. Residents may rely on a shared well and or septic system for their home. In some cases they may be served by a private water company. Homes in county islands also do not receive solid waste collection services from the surrounding city. Residents must contract with a private company for residential trash collection and do not receive bulk trash pickup without an additional charge. County Islands may or may not have paved streets, sidewalks and streetlights. If they do, they are not maintained or serviced by the city. Calls for police assistance will be responded to by the County Sheriff, which may result in a longer response time than the local municipal police force. Fire and Emergency/Medical services are not usually provided to residents in a County Island. In some cases there may be a special Fire District to provide services, or residents may subscribe to services from the surrounding city for an annual fee. Residents of a county island are not eligible to vote in city elections, such as for the mayor. (They can still vote in county, state, and Federal elections). Will a county island always be a safe haven? Living in a county island may be appealing to some people who favor reduced government involvement in their lives. However, the status of a county island is not guaranteed. In some jurisdictions, a county island may be annexed by the surrounding city if 51% of the residents vote in favor of the annexation. While it is unlikely to happen, it has happened before and could happen again. However, this is unlikely since many of the residents of a county island are likely to live there by choice and may share a similar mindset and reasons for living in such an area. Are county islands a good place to live? Well, that depends on your perspective. Living in a county island may align with your personal beliefs about reduced government intervention in the lives of private citizens, or if you are a business owner, there may be some real financial incentives to living in an unincorporated area. However, many county islands are lacking in basic city amenities such as water and trash service, sidewalks, streetlights, or even paved roads. Residents may not like having to pay private companies for trash collection or paying an annual fee to be receive coverage by emergency fire/medical services. Now that you know about some of the advantages and disadvantages of county islands, you can decide for yourself if living in one is right for you. 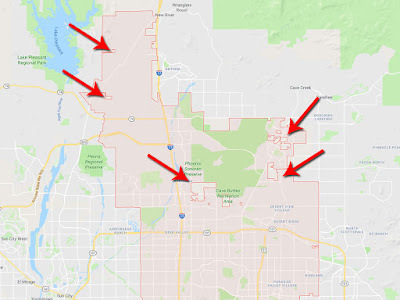 It is something to be cautious of if you are moving or relocating to the Phoenix area and are not familiar with the concept of County Islands. Four years ago, I wrote a post called The Mystery of Phoenix Northgate that explored the history behind a large, vacant parcel of land near 19th Avenue and Bell Road in North Phoenix. Several commenters wrote in to share their knowledge of the ill-fated development. The land eventually became State Trust land, which is often sold at auction. 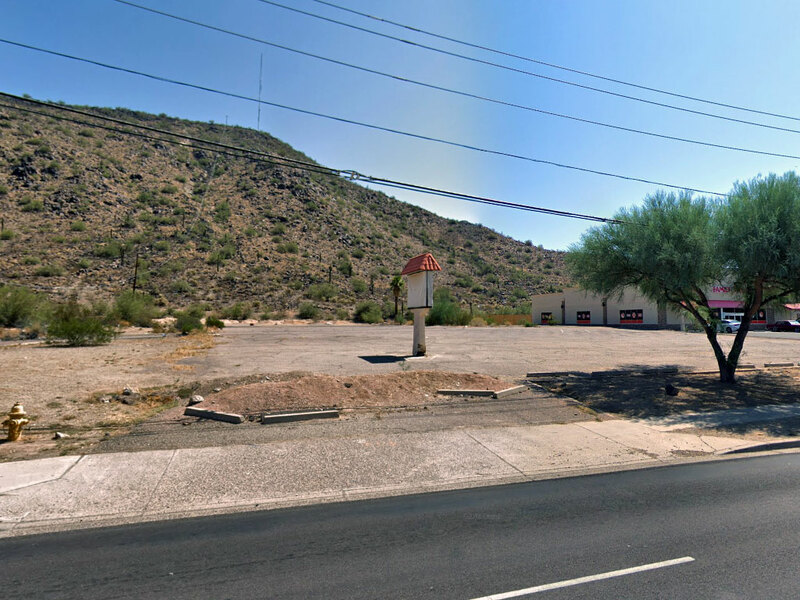 Earlier this year in June 2018, the Arizona State Land Department sold the 93.25 acre parcel at auction for $26.5 million dollars. The buyer was a San Diego, California developer called Sunbelt Land Holdings. Proceeds from the sale of State Trust Land go into a fund that benefits Arizona's K-12 public schools. 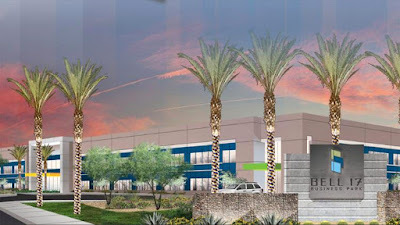 Concept Illustration of the Bell 17 Business Park by CBRE. After sitting dormant for decades, progress on the land across from the famous Turf Paradise race track now appears to moving along quickly. The Phoenix Business Journal reported on November 13th that Sunbelt Land Holdings had purchased another parcel of land, 51 acres in size, near 40th St and the Loop 202 freeway, for $25.8 million. Sunbelt plans to develop master-planned business parks on both sites. The North Phoenix location is tentatively called Bell 17 Business Park, according to a sign on the property. Initial plans call for 1 million square feet of developed space, spread out over 12 to 16 buildings. The development will include both office and retail space, according to the Business Journal. The project is expected to break ground in the year 2020. The developer has selected Balmer Architectural Group Inc. for the project, but has not yet announced a general contractor. The neighborhood surrounding 19th Ave and Bell intersection has been struggling with crime and other issues for about a decade. The opening of a new Wal-Mart store on the southeast corner in early 2007 brought an increase in transients and other petty crimes to the area. Four Phoenix Police cars on a typical night at the 19th Ave and Bell Road Walmart store. 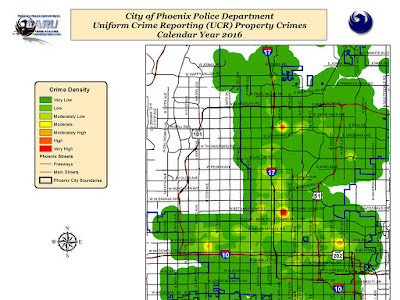 An article published in the Arizona Republic on December 14, 2016 studied the number of calls that Phoenix Police received from 2011 through mid-2016. 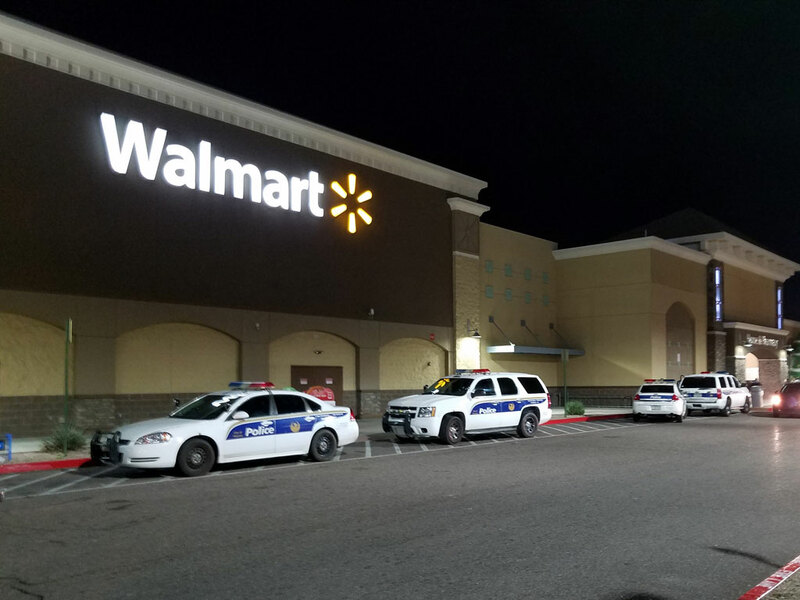 Records obtained by The Republic showed that three of the top five addresses with the most police calls were Wal-Mart stores. The 19th Ave and Bell Road Wal-Mart ranked 4th in Phoenix for highest number of police calls during the time period. Locations #2 and #5 on the list were large apartment complexes. Furthermore, a 2016 property crime report published by the Phoenix Police Department shows a "Very High" concentration of property crimes centered on the intersection of N 19th Avenue and W Bell Road in North Phoenix. This data is similar to the crime map published by real estate website Trulia, which pulls in data from SpotCrime.com and CrimeReports.com. Again, there is a high instance of crime in the vicinity of 19th Ave and Bell compared to surrounding areas. 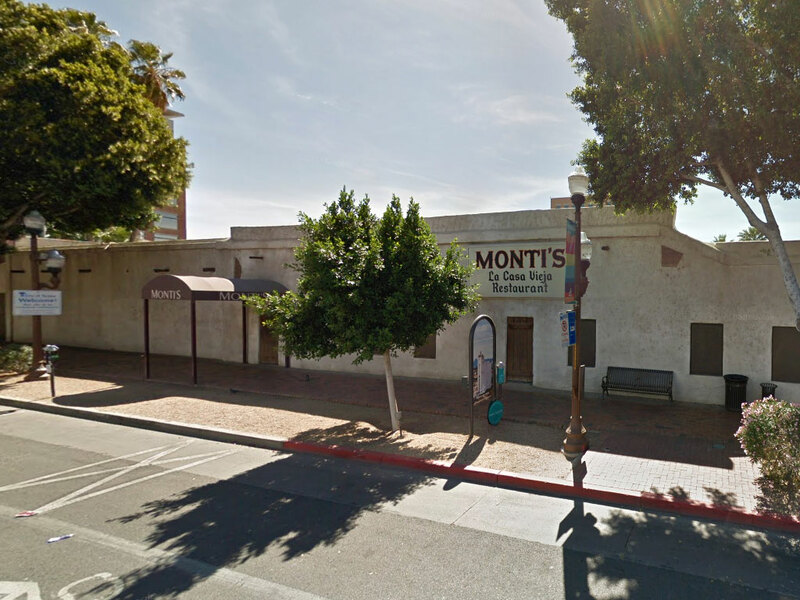 Famed local steakhouse Bill Johnson's Big Apple closed their North Phoenix location in May 2014. The restaurant was quickly transformed into Pawn 1st, a pawn shop, which is still in operation. 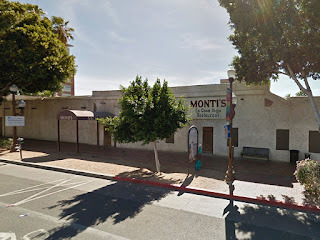 A nearby motel at 17th Ave and Bell Road (across the street from two different cash loan/title loan stores) is well-known to police and locals as a hotspot for prostitution. With a pitiful 1.5 star rating on Google, numerous reviewers mention prostitutes drug dealers, and homeless transients as a problem. With 335 reviews on Google and the vast majority of them being "1-star" ratings, there are enough of them that it simply cannot be a coincidence or an isolated incident. Will the construction of a new master-planned office park at 19th and Bell help turn this struggling area around? 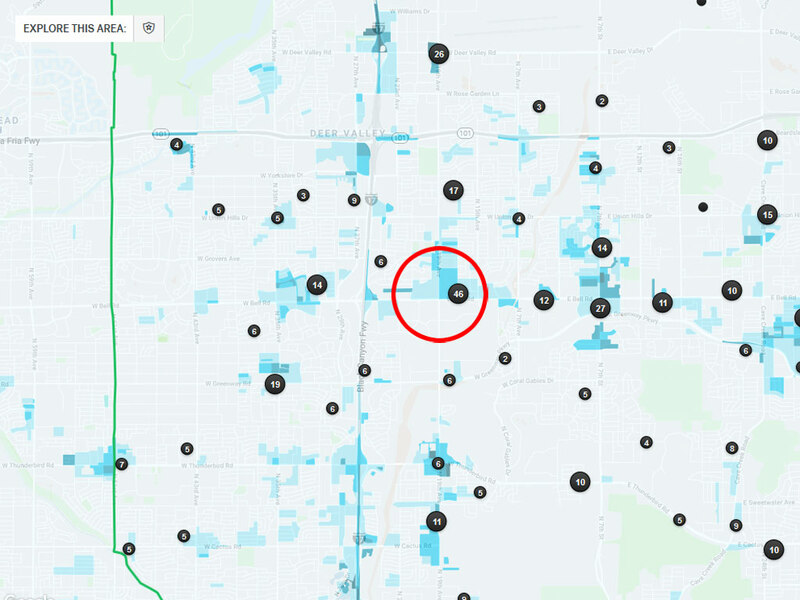 It is hopeful that the addition of higher paying professional jobs will clean up the area, which is surprisingly rough considering its location in the otherwise quiet sprawl of the North Valley suburbs. We'll be sure to keep you updated on this project as it moves forward.